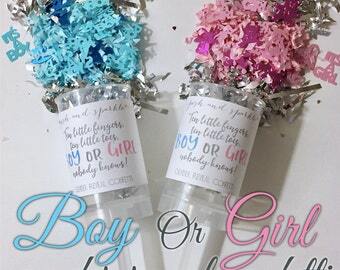 These confetti push-pops are a perfect way to announce whether they are a he or she at your baby's gender reveal party! 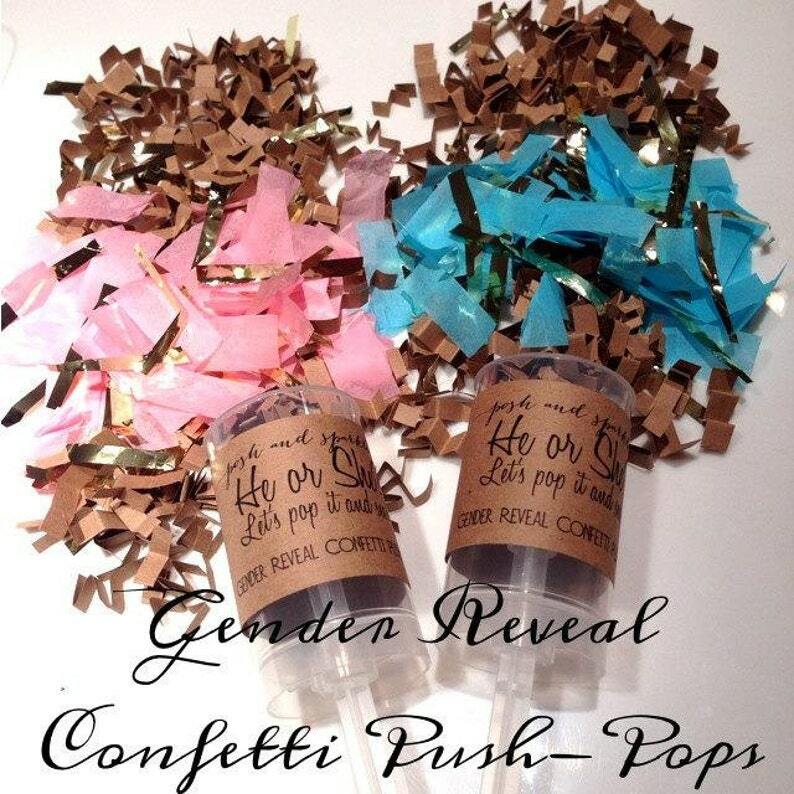 The push pops label covers the colored confetti so that the gender is not able to be seen until the push-pop has been popped! 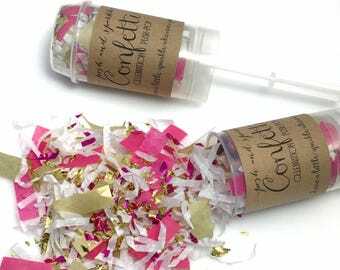 This confetti mix is made up of crimped kraft paper, gold foil tissue, and either pink or blue tissue. 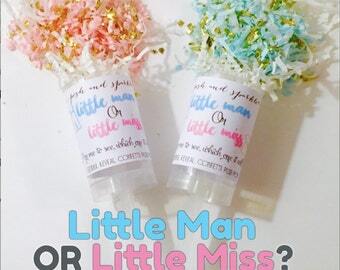 The label tagline reads: "He or She? Lets pop it and see!" The push pops are reusable so you can fill them back up with anything you want for another event! If you would like to re-use them with another one of my products, I am happy to discount the regular order price if you mail me back your empty push-pops to be refilled! Production time for a set between 1-10 push pops is 1-2 business days. For a set of 10-20 pops production time is 2-3 business days. Above 20 pops is 3-5 business days. *Please note that kraft paper in general does vary in shade slightly based on a per-batch basis, if you are needing to match a specific shade of kraft paper, please inquire about the current stock prior to purchasing. Really cute and nicely put together. Confetti came out all in one pile for us and not scattered, but overall we liked it! Beautiful decor and flowers, but it did not pop. Flowers just fell onto the ground. We accept all payment types that Etsy supports. - Customized items/orders are not eligible for a refund. Items that are not customized, are however eligible and can be returned within 14 days of your delivery date. - To initiate a return or report an order issue, please contact us within 5 days of delivery. - All returns must be mailed back by the buyer at his/her own expense within 14 days of delivery. - Returns must be received in the same new, unopened/unused condition that it was mailed to be eligible for refund. Therefore we do recommend purchasing shipping insurance for your returns. - Customized items/orders are not eligible for cancellation. Items that are not customized, are however eligible within 2 hours of order placement. The time we need to prepare an order for shipping varies. For details, see individual items. - USPS First Class Mail: estimated delivery time of 2 to 5 business days. for a custom price quote. please message us for a custom price quote. - Buyers are responsible for any customs and import taxes that may apply. Posh and Sparkle® is not responsible for delays due to customs. be purchased for an additional charge. please contact us prior to ordering. How do I use a confetti push-pop? 1. Remove plastic shrink wrap before use. 4. Don't forget! 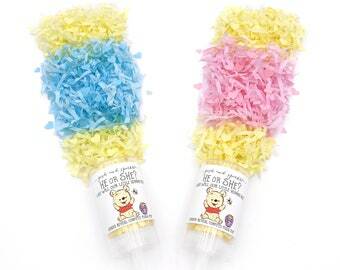 All our confetti push-pop containers are reusable, and food safe! So save them and re-fill, or use them for fun foods like desert pops! We gladly accept custom orders, almost every product is able to be customized, or tweaked to fit your needs. 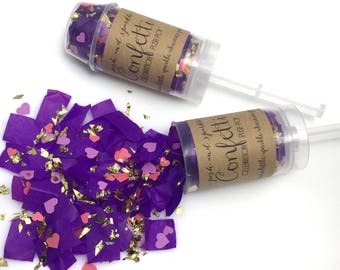 We can easily match your confetti to your special event theme! Just send us a message PRIOR to ordering, with your desired style and colors to confirm pricing and availability. We've ordered before, but this time the push-pop lid height was a little taller/shorter, are they used the same way? Yes! There is no difference, they are the same product, and are used the same way. Your order however will always be uniform, meaning you'll never have a mix of lid types in one order. If you have a preference between the 1" or 1.5" lids, please inquire prior to ordering to confirm our current inventory. How do I plant the "Seed Paper" labels? - Can be planted indoors or outdoors (recommended not to plant outdoors if there is extreme hot/cold temperatures). - Use a pot 2/3 full of good potting soil, you want the pot to be firmly full, but no packed. Plant seed paper under 1/8” soil. - Water thoroughly. You want the pot to be nicely damp. During the first 10 days, keep the paper moist at all times. Place in a sunny corner during germination. - Once sprouts appear, continue to keep the paper moist but be careful not to overwater. Once sturdy plants appear, water as needed. *Please note these are the recommended planting instructions directly from the manufacturer we source our seed paper from, Posh and Sparkle® does not manufacture any seed paper directly. 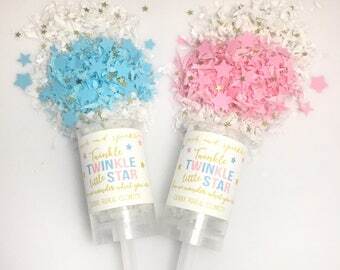 Do you offer bulk discounts for large confetti push pop orders? 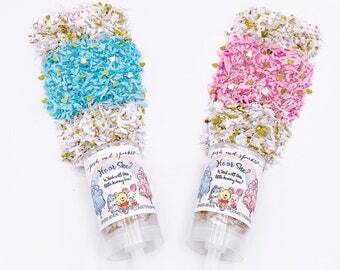 We currently offer a bulk discount of 25% off all confetti push-pop orders of 50+ pieces. We also include a FREE custom label design with these bulk orders! To set up a bulk order, just send us a message or submit a custom order request. Are you a BRIDE? Will you have a professional photographer for your event? Send us a message and inquire about our additional discount for photography trade! *Bulk order discount is not valid on sale items or rush orders. Wholesale pricing for resale is available. To inquire about making a wholesale purchase, please send us a message with your business information and products you'd like to us to provide pricing for.